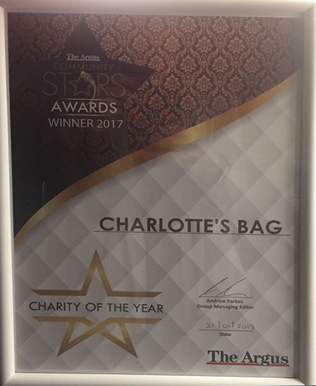 Alex and Cressy went along to the Brighton Argus Community Stars Awards recently – and came home with the award of Joint Charity of the Year for 2017! This was a high profile event locally, hosted by Fred Dinenage of ITV Meridian, and with sponsors including the British Airways i360, American Express, Brighton & Hove Buses, and the Charity award sponsor estate agents Kreston Reeves. We are delighted to be an official ‘award-winning charity’ just 15 months after launch, and having raised almost £130,000.